Anyone with diabetes has been told to take care of their feet and ankles. Failing to investigate problems and allowing them to deteriorate can have serious consequences, including limb amputation. One of these serious conditions is Charcot foot. 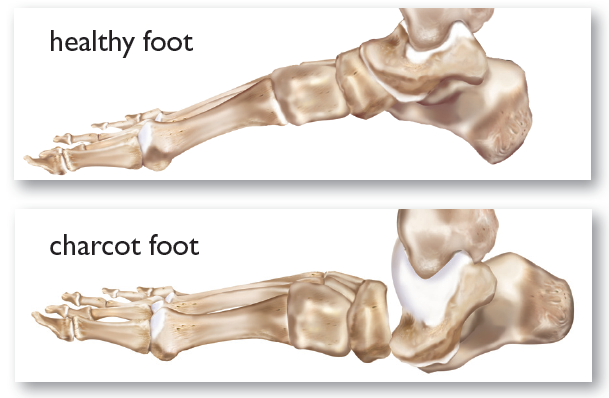 Charcot foot involves the slow breakdown of the bones in your foot, allowing the whole structure to collapse. If left unchecked, the condition can severely deform your feet and increase your risk for diabetic ulcers. It develops when you incur nerve damage from diabetic neuropathy. The fluctuating blood sugar levels in your body damage your nervous tissue, causing it to misfire and make you unable to feel injuries. This allows you to develop problems in your feet without noticing. Poor circulation from diabetes means your bones are weaker and more likely to develop cracks. Because you can’t feel this, however, you may continue walking and damage your foot structures even further without realizing it. Over time this causes your bones to grind down and collapse. As this happens, your foot will feel warm to the touch and may appear red. Usually there is visible swelling and possibly skin discoloration as well. You may be able to feel some soreness, too, though not to the full extent of the damage. The breakdown from Charcot foot significantly increases the pressure on your lower limbs. Over time, this can create serious diabetic ulcers, opening your body to bacterial infections. The problem will only continue to worsen the longer it goes unaddressed, increasing the odds that conservative therapies will not be enough to manage the condition. If permitted to progress too far, your foot may have to be amputated to avoid life-threatening complications. However, if you do seek treatment, there are ways to restore your lower limbs. Our doctors will evaluate your feet for an accurate diagnosis of the extent of your condition. Our trained staff will use X-rays, along with other tests, to get a clearer picture of the damage. Then we can consider your treatment options. Conservative therapies may be effective for mild deformities. The most important factor in recovery, will be controlling your sugar levels and managing your diabetes. This will help your body to be able to heal. You’ll need to remove all weight from the foot for several weeks to allow the bones to repair themselves. Your foot will be casted to immobilize it. Once the bones have recovered enough to bear weight again, you’ll need special, supportive shoes or braces to help manage pressure and prevent the condition from recurring. You may still need to adjust your activities to protect your lower limbs. A more serious deformity will require surgery. The procedure may involve lengthening tendons, excising bony prominences, reconstructing the arch, and stabilizing or fusing the ankle. The extent of the surgery will depend on how damaged your foot has become. After the procedure, your foot will be casted and immobilized to heal. Never ignore changes in your lower limbs, especially if you have diabetes. You can avoid the pain and damage of Charcot Foot by properly monitoring and caring for your feet. You don’t have to go through the pain and the damage. Pay attention to any changes in your lower limbs, and contact Country Foot Care immediately if you find something unusual. You can use our online MAKE AN APPOINTMENT button at the top of this page or call during our regular office hours.